Combo cable display kits are a versatile way to display both posters and literature. You can build a kit yourself from individual components or to make it easier you can choose one of our popular Poster and leaflet cable display kits. 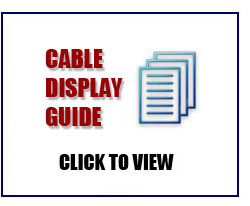 Our Cable display system has all the bits you need to build an eye catching display. Equally at home in Travel Agents, Estates Agents or Office receptions, You can choose a cable display systems that can be wall or floor mounted for use in windows. The cable display systems takes A3, A2, A1 posters and A5 or A4 brochures. If you don't see the kit you want you can build your own or call us and we can design a configuration for you.